A message from David Macdonald to Cecil’s supporters – now for some biology: Andy Loveridge and I repeat our thanks to all those who have donated to the appeal. In May 2008 in the dry, dusty South Eastern boundary of Hwange National Park, WildCRU research staff sighted two 5 year old male lions. They were sighted at Mangisihole Pan (which in the vernacular translates to the ‘waterhole of the Englishman’). These males were unknown to the project and were of an age when male lions are actively dispersing to look for a territory and a pride of females. Generally dispersing lions challenge and fight existing males or take over prides without a male. The WildCRU research project maintains a detailed database of lions in the population and these two were duly photographed and their sightings and identification logged. We use their unique pattern of whisker spots (these are unique in the same way as fingerprints), facial scars and ears knicks to identify the animals in the study. The lions were nicknamed the ‘Mangisihole Boys’. By late 2008 these buccaneering dispersers had invaded the core of our study and began associating with the Ngweshla pride and in so doing they displaced the existing pride male (know by the project, a little uncharitably, as ‘Ugly’). The odds of two to one were too much for ‘Ugly’ who relinquished his control of his pride and range to the victorious ‘Mangisiholes’. The new males wasted no time in asserting their control and immediately mated with the females of the Ngweshla pride, in the process killing three cubs sired by Ugly. At this point my friend and colleague, Dr Andrew Loveridge, with whom I started the project in 1999, darted the larger of the two males and collared him with a GPS collar as part of Hwange Lion Project’s ongoing behavioural ecology study. He was named ‘Cecil’ a quintessentially English name in recognition of his origins (at least in our records) at the ‘Englishman’s waterhole’. However, lion society makes ‘Game of Thrones’ look tame, and Cecil and his brother had to fight to hold onto their newly won territory. They were unfortunate that their neighbours were a strong and aggressive coalition known as the ‘Askaris’ and they soon lost ground, with Cecil’s brother killed in a boundary skirmish in June 2009. In the process the oldest of the Askaris- a venerable study animal called ‘Mpofu’ (and father to the other three members of the Askari coalition) was also mortally wounded and died soon afterwards aged twelve. On his own ‘Cecil’ could not hope to hold his territory and he retreated eastwards, leaving his pride and cubs to the not-so-tender mercies of the Askaris. Ironically, one of the Askaris was a large male called ‘Jericho’ , who with his brother’s Judah and Job were long term study animals whose fates we had followed since birth. These males dominated the Ngweshla area for the next few years. Though defeated in battle, Cecil was not beaten and soon established himself in another pride that was without a male. This pride, The Backpans pride, held a rich territory in the far East of Hwange and Cecil remained their pride male for three years, raising several cohorts of cubs until he was once again displaced, in 2013, by a coalition of two other males (Bhubesi and Bush). As he fled his territory he met up with his erstwhile enemy ‘Jericho’. Jericho had also fallen on hard times after his brothers Judah and Job had been shot by trophy hunters. So instead of fighting the two males formed a bond, initially uneasy but becoming inseparable as time went on. This is not unusual behaviour for male lions. Singleton males are hard pressed to hold onto their territories in the face of competition from larger coalitions. It makes sense to join with other unrelated males in order to have a chance to gain access to a pride. Having teamed up, Cecil and Jericho now dominated Ngweshla pride and from late 2014 also the Somadada pride. Cecil and Jericho have both been focal study animals in the core of our study area in Hwange National Park. Both have been monitored with radio or GPS collars for many years and we have collected hugely detailed data on their movements and territories. Their behavioural interactions with prides and other coalitions have enhanced our understanding of the intricate and often bewildering social lives of these big cats. 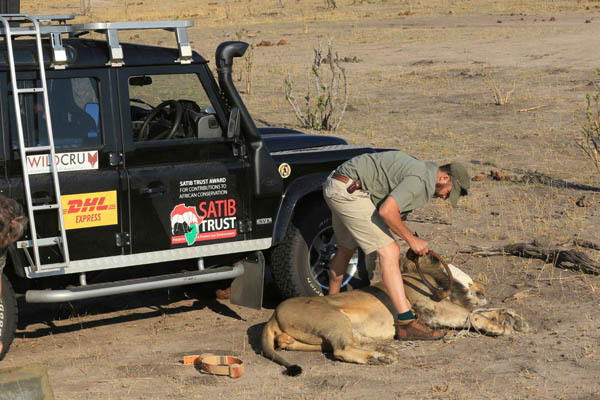 Both lions were well habituated to people in vehicles and were viewed, videoed and photographed by thousands of tourists from the seven photographic safari lodges within their range, as well as many self drive tourists. It is difficult to quantify their value to photographic tourism, but it is safe to say that Cecil was and Jericho remains well loved ambassadors for African tourism.